The circle symbol is universal, sacred and divine. It represents the infinite nature of energy, and the inclusivity of the universe. 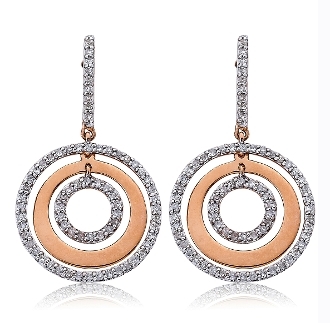 Symbolized here with this circle within a circle earrings in striking 14 Karat rose gold and 0.49 Carat t.w. earrings which create a glamorous and dramatic look. Perfect for proclaiming your love to that special someone. These secure with standard push backs.